When we look in the mirror, we know who looks back. Children learn that a mirror image is not a real person by the age of two. It takes them another year or so to recognise their reflection as themselves. Humans take this ability for granted, but it is in fact quite rare in the animal kingdom. So, what does your pet bird see in the mirror? The vast majority of animals will respond to a mirror as though it is another animal, at least at first. Some will attack their reflection, which of course fights back. Many birds fall in this category. Others will try to make friends and may even court the mirror image. Most animals will soon realise that the reflection is not real. In experiments with African Grey parrots, the birds will at first try to talk to the mirror, but give up when it doesn’t respond. They then start to look behind the mirror; some of us have seen cats do the same. The image has no scent and makes no sound, reducing its credibility. An animal needs to have a certain sense of self before it can recognise itself. Researchers test this by applying a mark to the animal in a place that is only visible in a mirror. The animal is unaware of the marking process. When it sees itself in the mirror, a self-aware animal will immediately touch the mark on its own body. Think of it as that moment in the bathroom when you spot the cappuccino foam on your nose. The only mammals, other than humans, that can do this are the great apes, elephants and dolphins. Monkeys do not recognise themselves. In the bird world, some members of the crow family show self-recognition. A magpie will remove a coloured sticker from its body when it spots the offending mark in the mirror, and so will pigeons. However, most birds, including parrots, don’t show this behaviour. Dr Irene Pepperberg has spent a lifetime working with African Grey parrots. She studies learning and language as part of the Harvard Animal Studies Project. Experiments in her laboratory looked at mirror use in parrots, with intriguing results. The researchers placed either a treat or a scary object in a small box. The open side of the box faced a mirror. Alo and Kyaaro, both African Grey parrots, took turns to approach the box from behind. The birds were quick to check the reflection in the mirror; and if the mirror showed a scary object in the box, they retreated, but if they spotted a treat, they retrieved it. Neither parrot ever mistook the reflection for the real thing – they looked at the reflection, but went straight for the hidden treat inside the box. In a second set of experiments, the researchers used a series of up to four boxes. They placed a treat in one of these. Alo and Kyaaro couldn’t see into the boxes, but they could view the contents in a mirror angled near the boxes. The birds were able to use the mirror to identify the correct box, containing a treat. Without a mirror, they couldn’t find the right box. This research shows that birds can use mirrors to solve problems. They somehow know that the reflection represents the real world. At the same time, one wonders how they explain the aloof but handsome stranger in the mirror. Budgerigars are not able to recognise themselves in a mirror. Not only do they seem to think the mirror is another bird, they also want to get to know it better. 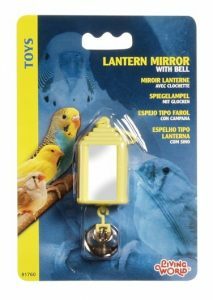 Budgies may even prefer a mirror to a real bird. Experiments have shown that, far from familiarity breeding contempt, this affection increases over time. Before cutting screen time for your pet, take heart in some positive effects of mirrors. Researchers at Saint Joseph’s University put mirrors with colonies of budgies. Birds who spent more time with their reflection also had stronger bonds with their mates. It seems that these individuals are more gregarious in general. For them, a mirror is good company when their mate is not in the mood. The intelligence of birds is well recognised. Pet birds often become bored, especially when housed alone. Cage enrichment by providing toys, including mirrors, is an excellent way to provide stimulation and in some cases may help prevent abnormal behaviour such as feather plucking. Mirrors may be even more effective with added sound, such as a bell. We may never know what our feathered friends are thinking as they look in the mirror. You are the fairest of them all, perhaps? With thanks to LoveMyVouchers.co.uk for this revealing look into how birds and other members of the animal kingdom react to mirrors.